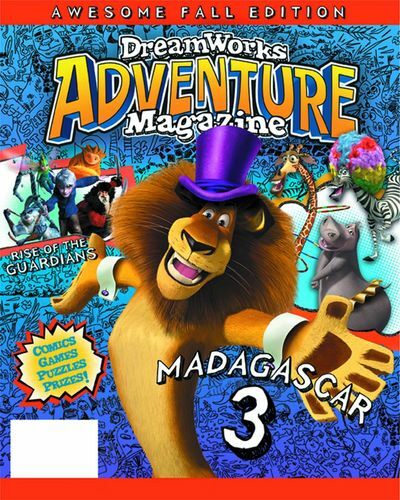 If you haven’t seen it yet: Dreamworks Animation has a new regular publication, Dreamworks Adventure Magazine, which they put out through Ape Entertainment. Each issue features new full-color comics of various Dreamworks characters and movies, as well as puzzles, artwork, and more. The latest issue (#3) features a Madagascar 3 cover and comic story, ‘Long Live the King’ backed up by a Megamind story, ‘Minion, Where’s the Car?!’. It also features a double-sided pull-out poster for Madagascar 3 and Rise of the Guardians. You can find out more at the Ape Entertainment web site for the magazine, but your humble ed-otter found one for sale at his local supermarket.